The new Can-Am Outlander MAX 6x6 4DPS 450 ATV, complete with true six-wheel traction and an incomparable versatility, is built to haul gear and get the job done. Along with a few of its own functional features, like its clever rear platform, the six-wheeled vehicle was purpose-built to be every bit as capable as its larger displacement siblings, but also introduce the 6x6 segment to new customers. For 2019, it receives the 6x6 family’s enhanced wheelbase, Tri-Mode DPS and updated passenger seating amenities and styling, while at the same time retailing for less than $10,000 USD, making it truly an affordable workhorse. The engine’s air intake and CVT inlets have been positioned as high as possible on the Outlander MAX 6x6 DPS 450 to improve breathing while navigating wet and muddy conditions. For situations that require optimal traction and as much contact with the terrain at hand, the Outlander MAX 6x6 offers both 4x6 and 6x6 with its Visco-Lok QE. In 4x6 mode, all four, rear wheels provide traction. Once 6x6 is selected, the system intelligently transfers power from the slipping front wheel to the opposing wheel with traction and is not hampered by speed or rev limiters. The system progressively and automatically locks and requires no additional buttons to push or levers to hold. The Outlander 6x6 vehicles use an industry-exclusive, four-wheel independent rear suspension that eliminates scrub and camber changes. The wheels pivot up and down rather than in a butterfly motion. This ensures the vehicle moves only in the direction you point it and is designed to improve traction and optimize transfer of power to the ground. Offering a five-way preload adjustable shocks and 8.8-in. (22 cm) of suspension travel, it can soak up rough terrain while keeping the rider comfortable and focused on the trail. When combined with its impressive suspension travel, Visco-Lok QE and true 6x6 capabilities, the 10.5-in. (26.7 cm) ground clearance on the Outlander 6x6 makes conquering rugged terrain a snap. The high-strength centre skid plate is made from proven materials and is designed for supreme protection and has the ability to slide over certain obstacles. Fully equipped to move a load, the Outlander MAX 6x6 450 has a reinforced 2-in. (5 cm) receiver hitch and a 1,650-lbs. (750 kg) towing capacity that comes standard. The Outlander 6x6 vehicles have a capacity of 5.4-Gal. (20.5 liters), which means one can ride longer and work harder. 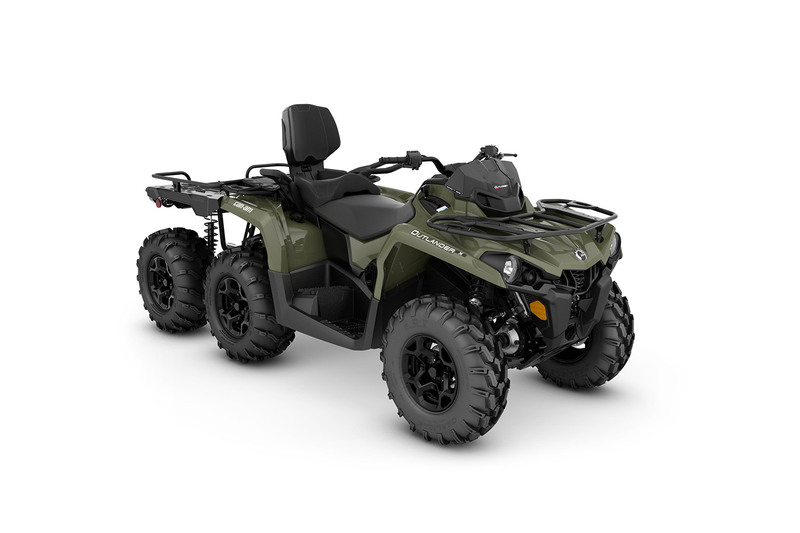 The Outlander MAX 6x6 450 ATV has front steel rack, offering the rider improved sight lines while driving without a loaded front rack and the ability to connect LinQ quick-attach accessories. The unique rear cargo platform is designed to be versatile and adaptable for hauling a wide variety of loads and includes added cargo extenders. The 2019 Outlander MAX 6x6 450 gets the family’s longer wheelbase. The added 90 in. length allows the passenger to sit in front of the rear axle for improved handling and comfort. The stretched design also improves the ride and handling for single riders. The Outlander MAX 6x6 ATVs have passenger-influenced ergonomics mimicking those found on the Outlander MAX models. DPC ergonomics means comfortable seating, cushioned ride and placing the passenger in an optimal riding position. The seating system allows for gradual bending of the backrest and pivoting to reduce kick back during acceleration / braking, as well as offering engineered enhancements like regressive flex and formed grooves for improved comfort. The Outlander MAX 6x6 features foot pegs with angles and depth that cater to the rear passenger. The footrests also have a third row of grips to improve lateral footing. D.E.S.S., an anti-theft device, includes both a performance key and regular key. Can-Am is the only manufacturer to offer a factory- installed anti-theft device as standard equipment. The Outlander 6x6 450 is available in green.